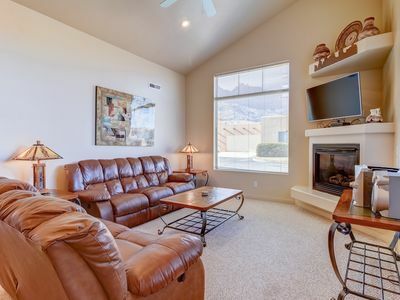 Spectacular Condo in Southgate Village Secluded Cul de Sac 360 degree views!! This is the one for you! 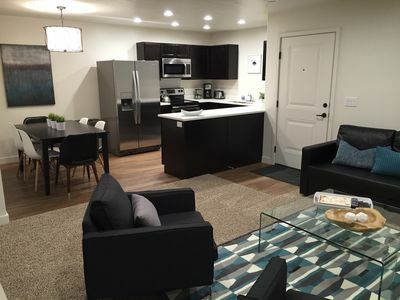 Southgate Village Condo, located just 5 minutes south of town. Just past the KOA Camp ground and before the Grand Arena. 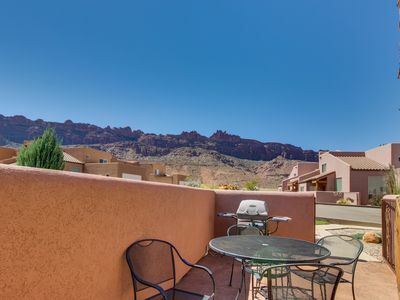 Our condo is located in a cul-de-sac, your kids can ride bikes and play without a lot of worry. 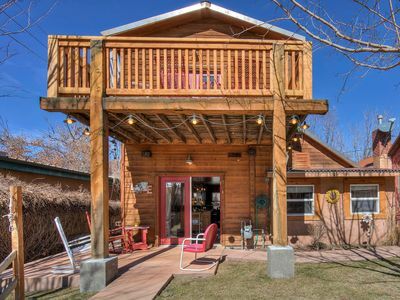 This is a great quiet area, away from the busy area of town but close enough to come & go without any trouble. 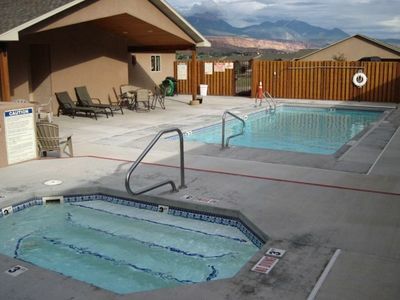 We are close to everything in Moab, when your done playing come get your rest here. 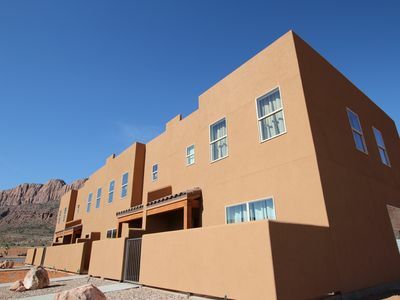 Our home features master bedroom with king bed, full size shower glass doors, double shower heads, huge closet. 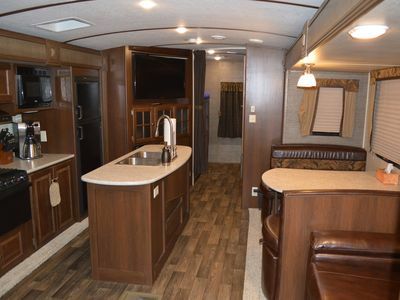 The next two rooms feature spacious queen beds, along with another full bathroom up stairs with shower & tub. Our condo can comfortably sleep eight guests if you have two people in each bed. (that would mean two people on the sofa bed as well). Each room has alarm clock, hangers in the closet & luggage stand for your bags. 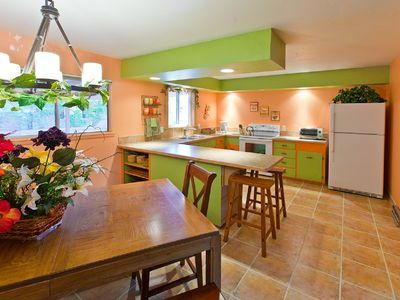 Also there is a GREAT size half bath on the main level. 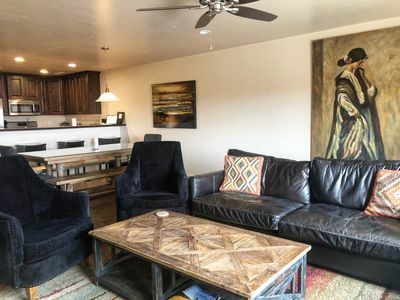 Beautiful stained concrete floors on the main level, plush carpet in bedrooms, and stone adorns the floors & walls in the bathrooms. 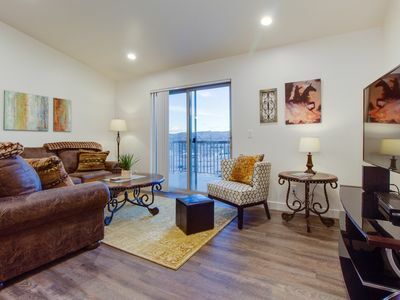 9 Foot ceilings & huge picture windows, which most of the condos around don't have. NO condos in the backyard the views just go on & on. There is also a huge playroom for the kids underneath the stairs with a fun little door, that makes a place all of their own. This play area is great for playing iPods or iPad minis, or watching movie on your portable dvd player, games. Our condo is 1691 living square feet, that does not include the garage. Total square feet is 2050. This condo was built with larger windows than any in our subdivision & a taller garage door than the standard to fit the big lifted jeeps in. All sheets and towels are provided for your stay. Master bedroom also features a huge walk out balcony for the greatest view you have ever seen. 360 degrees to be exact. So after a long day of doing whatever you can sit and enjoy the scenery. As if you already have not been doing that??? 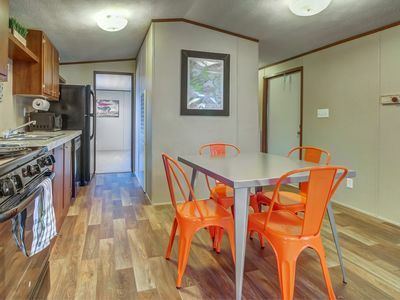 Kitchen is fully equipped should you want to stay in for dinner, brand new appliances, ice maker in fridge, dishwasher, microwave, coffee pot. The kitchen table comfortably seats four then our bar seats four as well. 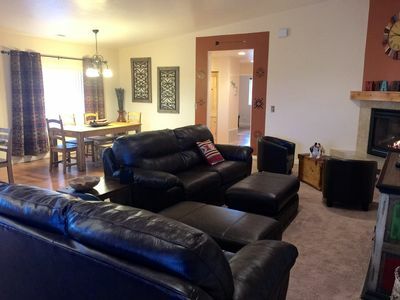 Living area has 47 inch flat screen Television with a DVD player and Dish network satellite TV. Master bedroom also has a 42 inch TV mounted on the wall. Sofa that turns into a full bed, & love seat. Extra blankets and pillows. 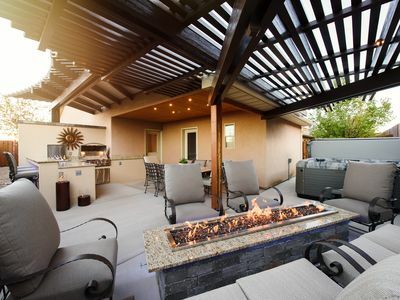 Nice cozy fireplace for the cool nights. HUGE laundry room; washer & dryer is ready to be used, if you need it. 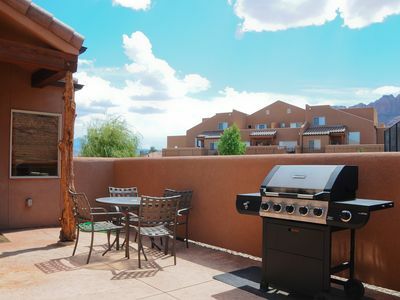 Gas bbq grill,( no need to worry about empty propane its plumbed directly in the wall). Patio furniture seating for four and (two extra lounge chairs in the garage can be used) on the walkout covered patio just off the kitchen. While your here you just relax and enjoy your time away from home. 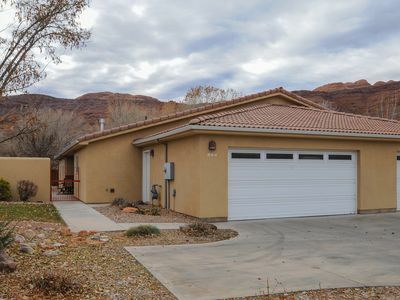 Oversize garage with plenty of space for your toys! Huge 8 foot tall door, to get those big & tall jeeps in, with no worry of hitting the top. Plus additional parking in the driveway. Plenty of trailer parking as well. Secure FREE wireless internet is also ready to be used by you. 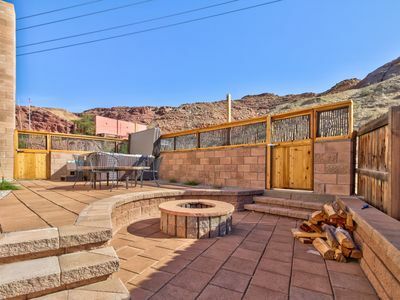 Things to do in moab are so exciting, from national parks, (arches & canyonlands) to jeeping, biking, hiking, 4 wheeling, golfing (award winning course right around the corner), rafting. The possibilities are endless! Please check out the calendar i keep it updated. I will usually respond to your email within the hour or sooner. If you want to call, please do so. If our calendar is not full, I CAN/WILL also do GREAT LAST MINUTE reservations, so just send me an email. If our CALENDAR is booked or you just want your friends close by I could possibly have someone in our neighborhood that can make that happen. Spacious! 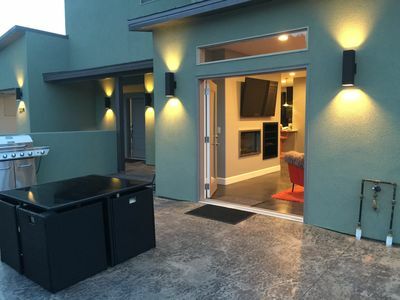 New carpet, seasonal pool & hot tub, near downtown! Family Friendly! 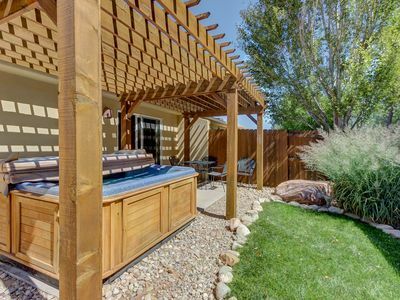 Great location with a private hot tub, shared pool, and great views! 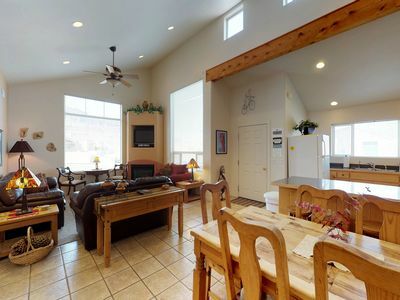 Desert-view getaway with shared seasonal pool & hot tub - near Arches! 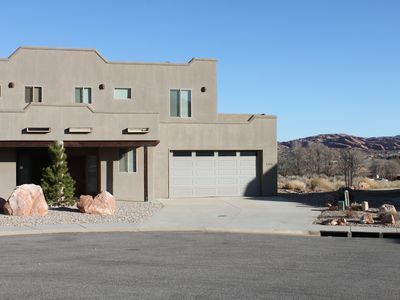 Spacious home w/ stunning views, close to Arches National Park! 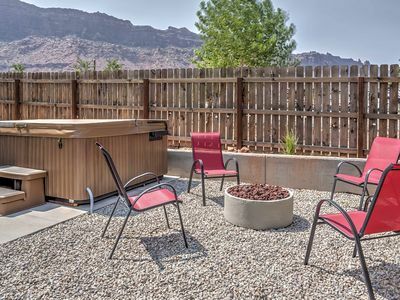 Moab Townhome w/ Hot Tub Only 20 Mins from Arches!